After their big remix for Twist3d last months, it's time for the first solo EP on MONOTON. 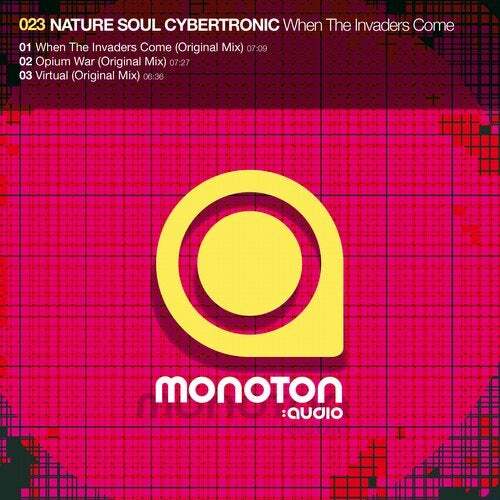 Nature Soul Cybertronic delivered a mind blowing 3 track EP. All three sub-basses will let vibrate every dancefloor. No remixes needed! The invaders are here already! NATURE SOUL CYBERTRONIC appeared as an original idea in 2002. Born in Cdiz, southern Spain, the brothers Daniel and Carlos Native constitute what might be called the brain, the heart and soul of this musical project. After a long period working in the studio they began to release some of that material on the German label Zensur Records. Now they release their material on labels like AK Lieder, MONOTON:audio, Hard Drive Records, Bunk3r R3cords, Audio Stimulation Recordings, Hybrid Confusion and many more. They also collaborate with Technodrome booking, Warp Club Barcelona, Cuebase FM Germany and Omega 3 RUM Portugal. Their goal is to offer a new interpretation of the electronic analogicaldigital scene in a more underground techno style.